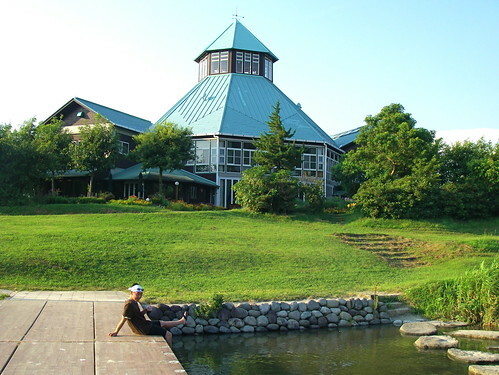 We took advantage of a recent semi-long weekend (Hideaki works in weekly shifts, so when a day shift ends on a Friday and a night shift starts on a Monday it's an almost-long weekend) and had ourselves a mini vacation. We expect this will be the last trip with just the two of us for a very, very long time so wanted to make it special, but time and budget constraints meant we had to give up our grand plans for Okinawa and settle for something a little closer. 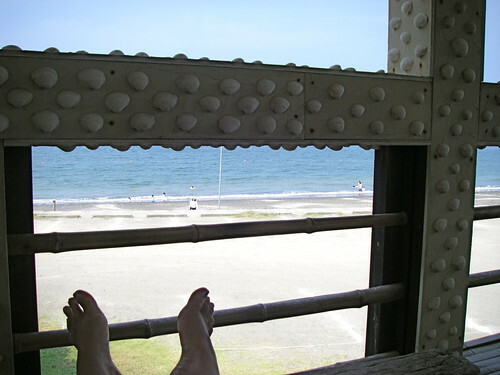 So we rented a car and drove to Chiba prefecture's Bousou Hantou (Boso Peninsula) for a few days of fun in the sun. 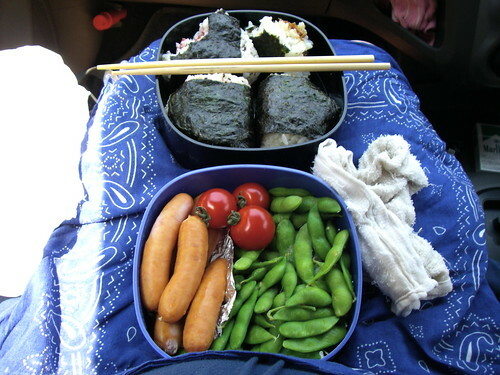 I had packed a lunch that we were hoping to eat at on the beach if we made really good time, or at least at a rest area along the way. But we hit traffic as soon as we got on the highway and with the car's GPS telling us we'd be on the road for seven more hours we ended up eating in the car. Inside a tiny rental car on a crowded Japanese highway is not the most scenic of places for a picnic, but it was kind of fun, and certainly gave us something to do in the gridlock. Of course as soon as we finished the traffic cleared up and the trip took three hours rather than seven, but eating on the run did save us a bit of time so it wasn't the end of the world. 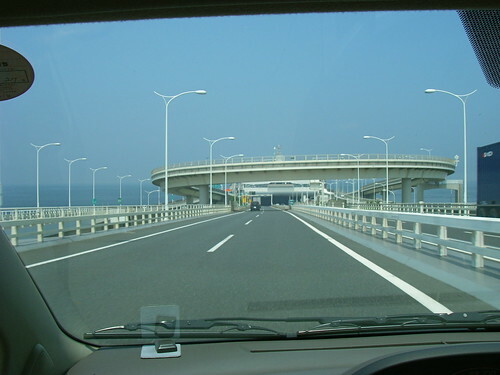 We took the fast way, which involves driving down to Kawasaki in Kanagawa Prefecture and crossing Tokyo Bay on the Aqualine, a cool tunnel that goes deep under the water and emerges halfway across the bay as a bridge. 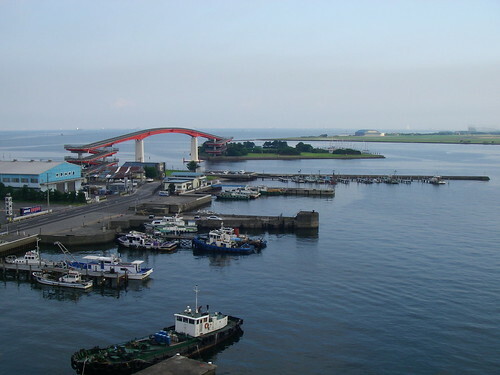 You hit land at Kisarazu, Chiba, and save yourself at least an hour (much more with bad traffic) compared to driving around the bay. The picture above was taken on the way back and shows the bridge about to disappear under the tunnel. 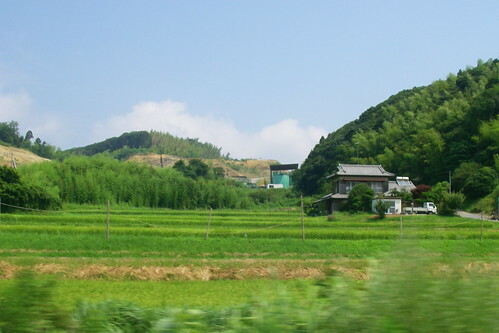 I always love the feeling of leaving ugly, industrial Kawasaki, above, and emerging to the greenery of rural Chiba, below. 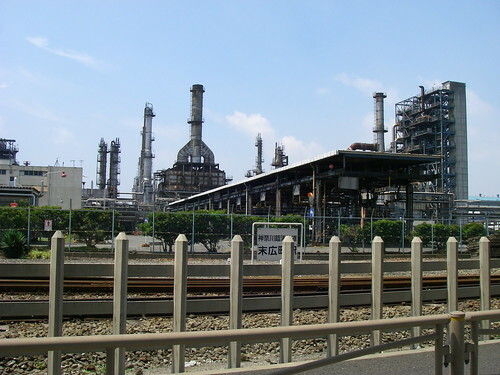 Actually Kisarazu is itself an ugly, industrial city, but the route we usually take bypasses much of the unsightliness so it really is quite a dramatic change or scenery. 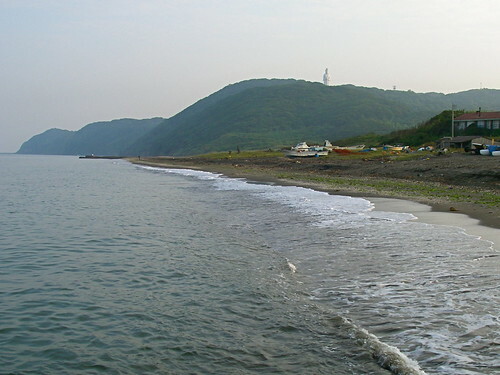 Once you go a bit south of Kisarazu, Uchibo (the inner coast of the Boso Peninsula along Tokyo Bay) is lined with numerous beaches, most of them not very remarkable. 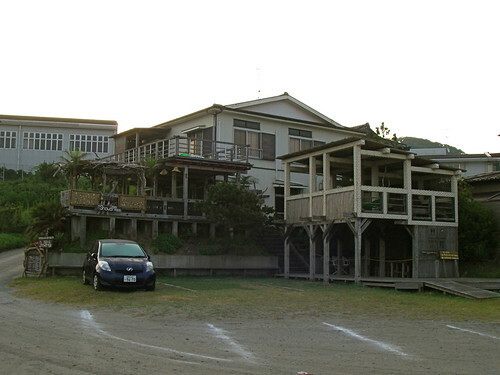 We stopped at one in Tomiura called Namuyakita Kaisuiyokujo (Namuyakita Beach), chosen for its lack of umi no ie (beach huts) and other facilities. It wasn't the most beautiful beach ever, but as we'd hoped it was nearly deserted and we had a wide stretch of sand and water to ourselves. So after a few attempts at sandcastles we gave up (wrong kind of sand) and jumped into the water for a swim. 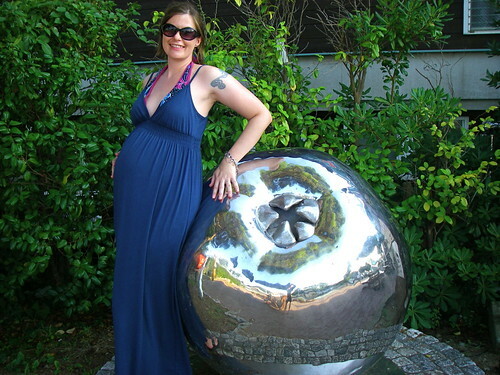 This was the first time I'd been in any body of water bigger than a bathtub since I got pregnant, and man did it ever feel good. It was much harder to float with a full uterus (I'd hoped my tummy would stick out way more in the picture above, but my middle kept sinking) and couldn't do much real swimming, but just being in the water was heavenly. No, this wasn't Okinawa, but it wasn't bad. Even Hideaki, who normally considers a water temperature anywhere below 30C to be unswimmable, enjoyed the water. When the sand fleas got to be too much (we'd timed the trip carefully to avoid the annual mid-August arrival of the jellyfish, but hadn't counted on stinging sand fleas) we drove to a michi no eki (a non-highway rest area, a smaller, quainter version of the big highway service areas) in Tomiura. 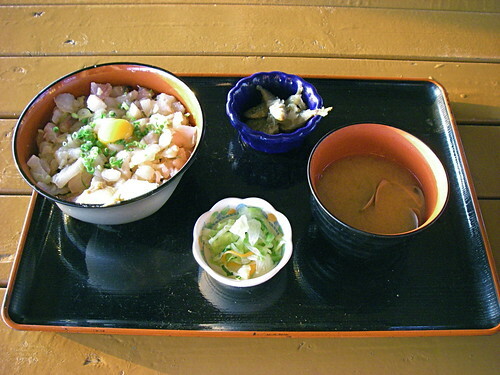 Called Biwa Kurabu, its shops and cafeteria were dedicated to products made with the locally famous fruit, biwa (loquat). So we cooled down with a biwa ice cream, took some pictures of the giant biwa sculpture out front, and planned our next move. 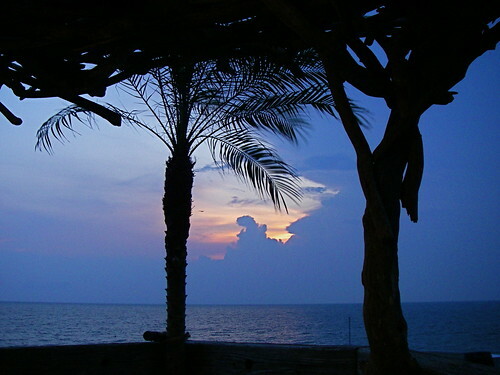 And our next move was dinner at Kanaya, a seafood restaurant in Futtsu. 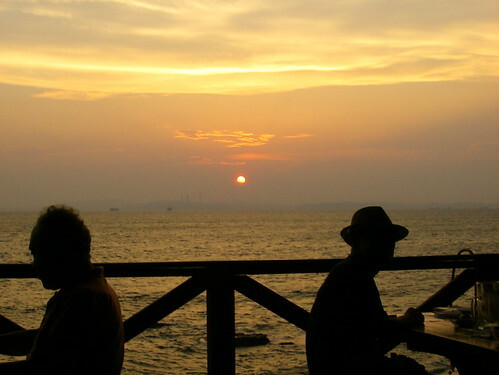 I'd chosen it from an online search because it was cheap and had outdoor seating with a view, and although it turned out to be a bit touristy it did deliver on the view. 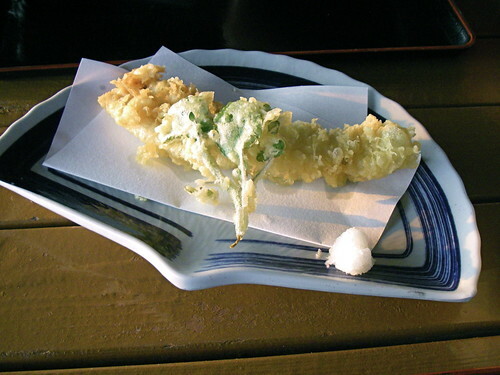 We started with anago (sea eel) tempura, Tokyo Bay and the Futtsu area in particular being known for its eel. It was lighter, milder and less oily than any anago I've had before, and actually reminded me of fish & chips. 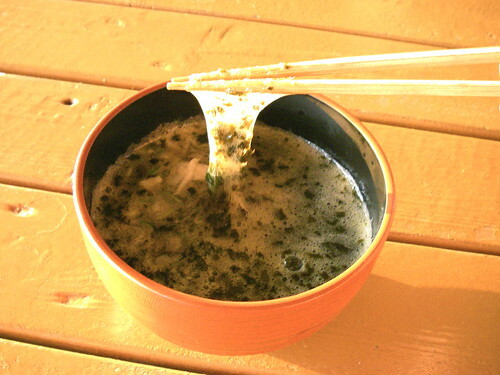 Next we tried kajimejiru, a soup made with miso and the local kajime seaweed. Kajime is one of those slimy, sticky foods, like okra, that you either love or hate, and we loved it. Unfortunately clouds prevented us from watching the sun finish setting over Kanagawa on the other side of the bay, but the sky had no shortage of shows for us that night- we were treated to a full moon and a local fireworks show. The fireworks were quite spectacular, or at least the ones I saw were- we found a spot on a pier next to a large group of local fishermen and their families, and were first befriended by the fishermen, who brought us cans of beer and a big plate of yakiniku (grilled beef), then by their daughters. These two little girls were fascinated by my foreignness and full of questions, and every single thing that I told them ("Indo" is "India" in English; we came all the way from Tokyo; yes, it's possible for a Canadian to marry a Japanese) completely blew their minds. Living in in the city it's been a long time to get that kind of reaction from Japanese kids, but they were really cute and polite (I had heard them whispering about us long before they approached us, and they actually used the respectful term "gaikokujin" instead of the usual word for foreigner, "gaijin") so I didn't mind their questions at all. I would have liked to have seen more fireworks though! We stayed at a love hotel in Kisarazu, which sounds naughty but is actually quite practical- love hotels are easy to find, don't require reservations, come with tonnes of amenities, and are far cheaper than regular hotels or inns. Plus: jacuzzis! This place was rare in that not only were its windows not blacked out, it actually had a balcony. The night view was kind of pretty, with airplanes landing and taking off at Haneda airport in the distance, boat lights in the bay, and a rainbow light show on the weird bridge to nowhere seen in the picture above, taken the next morning. 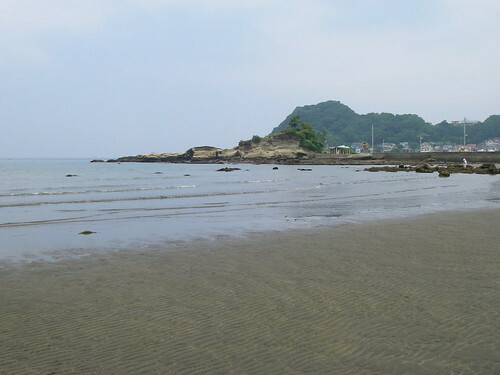 The next day started with breakfast at McDonalds, and then we drove back down to Tomiura to Haraoka Kaisuiyokujo (Haraoka Beach), chosen for its promise of decent snorkeling from an online search. 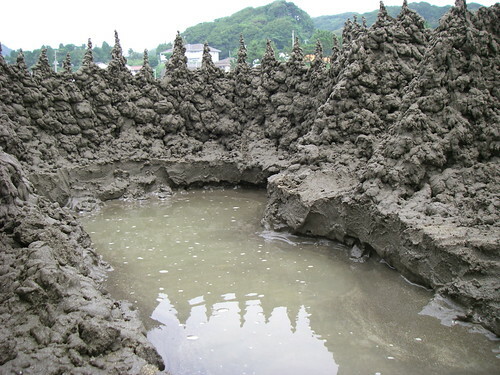 That's the last time I trust a stranger's definition of "decent snorkeling", as there was absolutely nothing to see underwater, but it turned out to be a really nice beach with an endless shallow area, a few wide sandbars, and the finest sand I've seen in Japan. 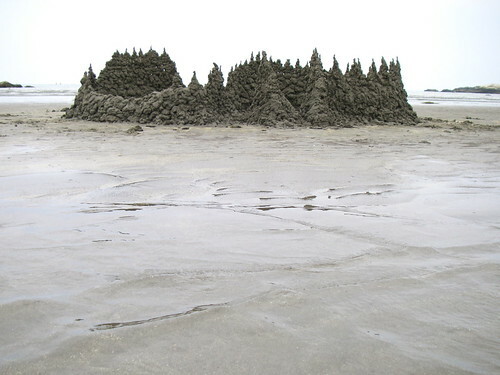 Perfect conditions for sandcastle making. 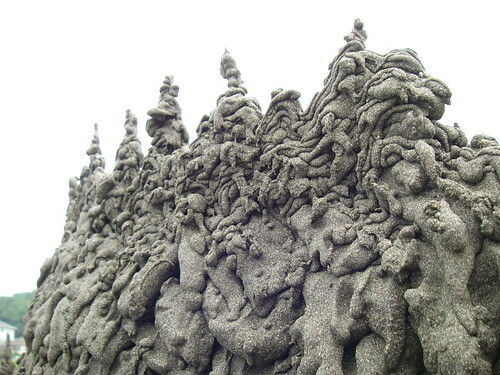 This beach also had sand fleas, so after a short swim we drove down to Tateyama to Okinoshima, a former island now connected to land by a sandbar. The beach was terribly crowded and we barely found seats in one of the umi no ie, where we had overpriced yakisoba (fried noodles) and other snacks for lunch. We escaped the packed beach to the island, which had a few snorkeling spots that were blessedly empty of people. It wasn't great snorkeling but we did see some neat fish and got lots of swimming in. This was only Hideaki's second time snorkeling but he already had the hang of it, and I was the one being all nervous and tired (a big pregnant belly will do that). All tired out, we drove back up to Futtsu to Shinmaiko Kaisuiyokujo (Shinmaiko Beach) to check into our minshuku (family-run inn), Kinkaitei, shown above. We'd stumbled across this place on a trip a few years ago and really liked the food and the funky, laid-back atmosphere, so had vowed to come back some day, and here we were. Minshuku are always Japanese style, with tatami mats on the floors, spare furnishings, and a closet full of futons and bedding that you set up yourself. 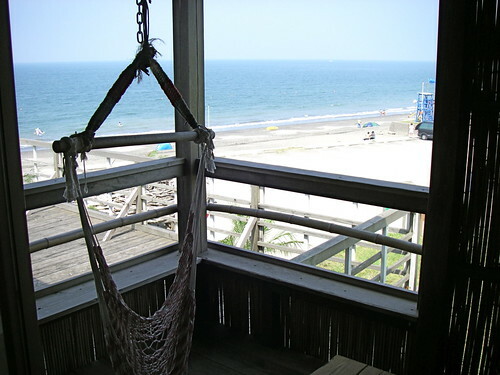 Our room was typical, but it came with a little balcony (accessed by climbing out the window) with a loveseat, mini hammock, and view of the beach. Dinner was served on the patio as the sun was setting, and although the clouds again prevented a spectacular display we could hardly complain, as the view was still lovely and the food fantastic. And plentiful- I kept taking pictures, thinking all the food had been served, and then more dishes would arrive. Our dinner, front row from the left: rice; grilled local fish; miso soup. Middle row: vinegared octopus and wakame seaweed; deep-fried eggplant stuffed with pork; kabocha no soboroni (kabocha squash simmered with ground chicken). Back row: nukazuke (rice bran pickles) of cucumber and shiro-uri (Japanese pickling melon); assorted sashimi. I forgot to take notes so don't remember what kind of fish it was, except that the second from left is kinmedai (alphonsino) and there were two other varieties of tai (bream). 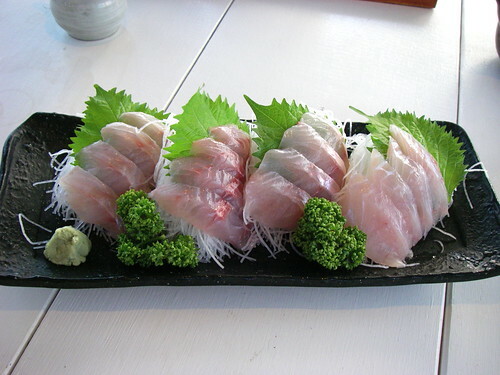 It was all delicious, especially the kinmedai, which unfortunately I could only have a little of as its fairly high in mercury and I'd just had some the night before. Lucky for Hide. 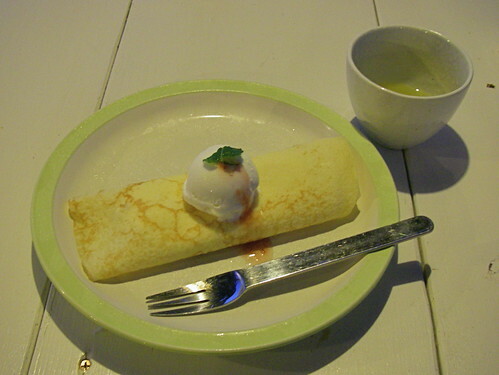 I finished with a banana crepe (Hide had locally made vanilla ice cream) and we sat enjoying the view, then went out for a night time walk on the beach. The next morning I woke up bright and early (I don't know if it's a pregnancy thing or what, but these days I'm lucky if I sleep past 5:30) and left Hide sleeping while I went for another walk on the beach. Above you can see Futtsu's famous Tokyo Wan Kannon (Tokyo Bay Bodhisattva), one of the largest Buddhist statues in Japan. I also took a swim, ignoring the sign that prohibited swimming before 8:30 (nobody was awake to report me). I can still see my feet! Or at least my toes. 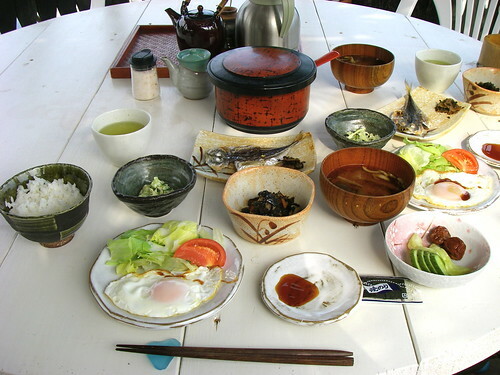 Breakfast was on the patio again, and again the dishes kept coming and coming. 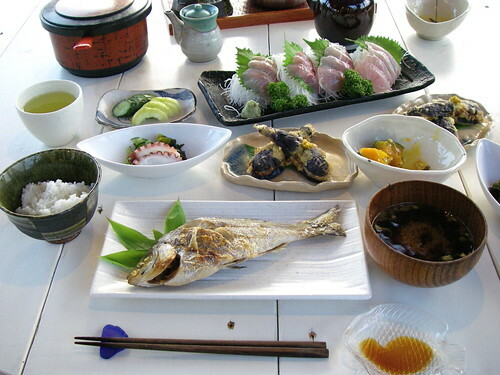 Clockwise from left: rice; goya (mitter melon) dressed with tuna; aji no himono (partly dried and grilled horse mackerel); miso soup with eggplant and myoga (Japanese ginger bud); nukazuke of cucumbers, shiro-uri and umeboshi (salted ume plums); nori seaweed sheets and soy sauce (to eat with rice); fried egg with salad; and hijiki seaweed simmered with soybeans and vegetables. Breakfast kept us too full for another swim, so we hung out on another patio, trying out the hammocks and comfy seats and staring at the beach until it was time to checkout. We drove home in time for Hide to have a quick nap before heading to work, thus ending our last trip as a couple. Hopefully not our last vacation ever though- we plan on having the portable kind of baby. I have really enjoyed your blof over the past few years, and wish you both all happiness for the future. "these days I'm lucky if I sleep past 5:30"
Looks like a lovely last trip. 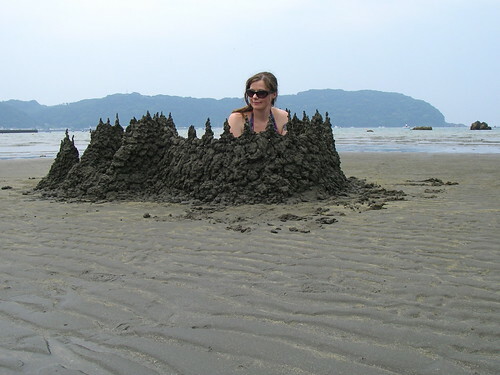 The sandcastles are rather unusual. Interesting, but different than ones we make here. 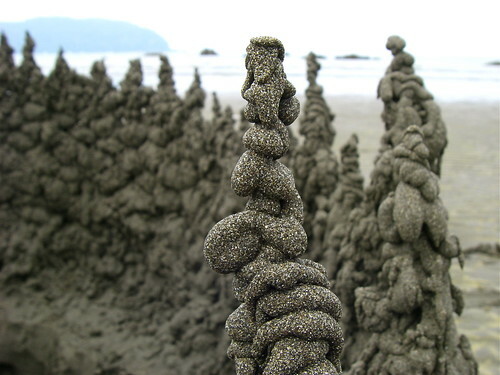 The sandcastles look like they were designed by Gaudi. Great pictures! Gen, this is probably too late but I wouldn't recommend Boso Hanto for the end of summer- like most coastal areas of Japan it gets inundated with jellyfish. 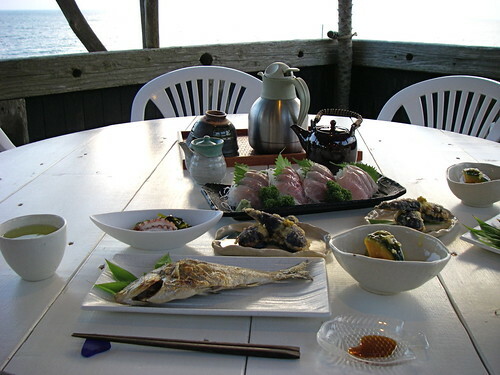 Shimoda is your best bet- it stays warm and jellyfish-free through September. 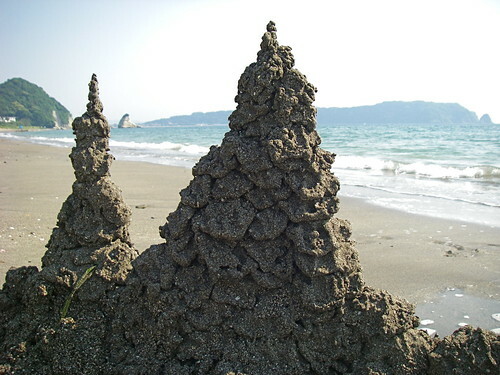 Joe, these are not Japanese style sandcastles, but the "glorp castles" that my dad taught me. Never seen anyone else make them that way! 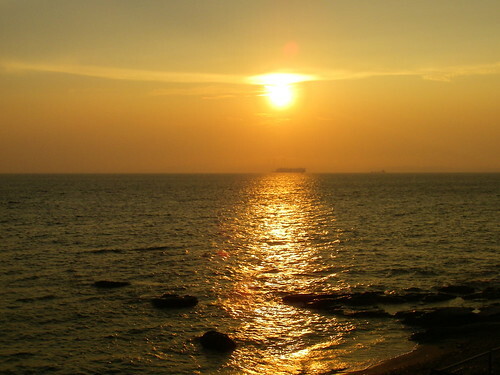 I live in Tateyama and have been swimming at Hojo and Chikura. 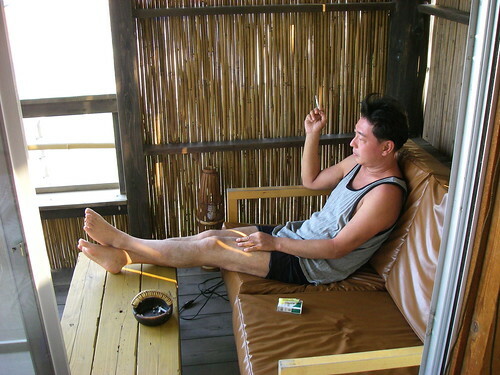 I really enjoy living here and have been meaning to get to Okinoshima.